We have lots of queries to do adjustment of Input and Output in a very easy manner. Adjustment entries provided in earlier post are not so difficult but as a beginner some people unable to pass those adjustment entries. So today we teach you very simple adjustment entries. As a basic nomenclature, out output liability is on Cr. side and Input credit is on Dr. Side, but reverse charge mechanism is on both side Dr. and Cr because 1st Reverse Charge Liability will be booked and after payment the same can be booked as input credit. So today we know this in very easy mode. But remember if you use combine ledger for Output and input liability then your tax liability appear net in same ledger and then no need to pass another journal voucher. 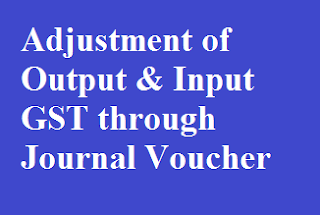 But if you are using seperate ledger for each input and output rate wise then you must need to create a journal voucher for generate tax liability. As in above case we have two type of rates of the product/ commodity. Purchase is @ 12% and Sales is @ 18%. You can see Electronic Cash Ledger, Electronic Credit Ledger and Electronic Liability Ledger. Electronic Cash Ledger and Electronic Credit Ledger is working like a passbook. Cash Ledger contains your all GST Payment month wise. Credit Ledger is contains your Input Credit Details month wise and Liability Ledger shows your monthly liability. So if you use multiple tax rate for input and output GST tax then first you need to create the all three ledgers as above, 1. Cash Ledger, Credit Ledger and Liability Ledger. This entry will move your GST liability to your Liability ledger and balance with match with your Electronic Liability Ledger. This entry will move your GST Input Credit to your Credit ledger and balance with match with your Electronic Credit Ledger. 3rd and last entry is Transfer your GST Payment to Cash Ledger. This entry will move your GST payment to your Cash ledger and balance with match with your Electronic Cash Ledger. Use only input Credit amount which is used for setoff against liability. This entry will create your GST Tax Liability and make outstanding balance of GST Tax for making payment.